The notion of urban or rural meat trapping is not a new one, an old German woman once told me that there were no dogs or cats in Berlin at the end of World War II and that she was a very good trapper. In her opinion, if the animal was roaming it represented food. I agree. I’ve tasted dozens of different urban meats from dog to rat to cat and many more rural wild meats. Many of these foods I personally trapped and others I ate while a visitor in another culture. Most were palatable and all were nutritious. As I munched some of these meals I began to understand that subsistence trapping is an important skill to know in times of hardship and severe shortages. Before we begin discussing trapping technique, I want to offer a few cautions related to viewpoint and ethics. 1) We are going to talk about trapping animals in this paper. If the notion of killing for food offends you, try to remember that the meat now on your table once walked the earth just as the animals you will trap are doing today. 2) Traps and snares are indiscriminate killers. You must be very careful when you set them so that you only capture the game you really want. You should also only set traps if you really need the food. Trapping in a survival situation is legal if it is used to keep you or your family alive. During the potential Y2K crisis you may need to resort to subsistence trapping, long-term reliance on your environment for meat proteins. If you want to practice traps and trapping before you need them, set your traps in a way that will allow the animal to escape without injury. For example, use an easily breakable string in place of snare wire. 3) Always remember the rule "IF YOU KILL IT, YOU HAVE TO EAT IT!". As disagreeable as this may sound it will discourage recreational trapping. If you know that you must eat anything you kill you will be very careful when you make the choice to trap. Naturally this rule does not apply to animals that are diseased. Finally, remember that some of these traps pose a potential danger of injury to the person setting them or to others (remember your enraged neighbors). Never set your traps where a person or child may encounter them. Always remove all parts of any trap when you are finished. Never leave a trap set up when you move from an area. Always check your traps frequently. Be careful with wild game. If they are alive in your trap they can injure or kill you. Some game may carry diseases or parasites that can make you ill. It is not the intention of this article to give you a complete rundown on all traps and trap styles. Our Woodsmaster video Volume Five on Traps and Trapping handles many more trap designs and shows you how to make and set them. There are literally hundreds of different types of traps and snares. We will be examining just a couple of the designs. The ones we will look at represent oneof the two basic trap designs. The two basic traps are the machine type and the holding type. We will be looking at holding type traps because they offer the greatest potential for success and are the easiest to construct and use for a beginner. They have the flexibility to become live traps, which give you the opportunity to release unwanted captures unharmed. 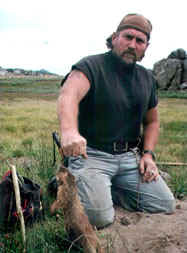 Holding type traps are generally simple snaring traps. The second type of trap, Machine type traps rely on the principles of leverage and the movement of trap parts to kill or restrain their prey. The actions of a machine type trap are usually restricted to lifting or crushing. What distinguish most machine type traps are two elements. One; is the engine or power that operates the trap. Two; is the trigger that allows the engine to express itself. These two elements frequently confuse construction and setup for the beginner. You will find them in the tracking video. A snare is an easy and efficient way to multiply your success at putting meat on the table. Trapping is typically very energy efficient and can be done in areas close to your home. In any trapping situation coverage and set are the keys to success. Coverage: The more snares you set the greater your chances of success. How many snares is a good idea? In a best case situation you will be doing well with a 25% success rate. That means that if you want to eat every day you need a minimum of four snares. I like to set at least eight snares. Set: Look at animal trails in grass. Try to understand the movements of the animals you are trying to snare. Game trails can also help you to select the types of animals that might end up in your snare. Try to get a game’s eye view of the path you plan to trap. Get low on the ground to get a sense of their viewpoint. Check the ground where you are setting your traps. Look for sign of both your prey and other carnivores (like dogs and cats!). If you have time, sweep the trail with a switch and reexamine it in the morning… you’ll learn if the animals are using the trail. Our Tracking video gives a good rundown on tracking pits and other tracking techniques. When you place the snare, attempt to conceal the wire or cord you are using. Most animals are very quick to identify anything that is out of place. If you have the option, set traps for large animals like dog or deer. It is more productive in subsistence situations to go after larger game. You get more meat and materials like the hide and bones that can be used. When trapping a larger animal the snare mostly acts to restrain the animal. You need to close in and kill it with a tool of some sort. This can be very dangerous. Any small caliber weapon, like a .22, should be adequate with a properly placed shot. Keep an eye on your traps. Other animals, especially carnivores, may get to your food before you do. Dogs and Coyotes will sometimes let you know that you’ve caught something at night. You’ll hear the chorus. You may be able to chase them away before they get to your catch…. They will run if you make noise as you approach. Wild dogs may turn on you, which is a good reason to consider reducing the stray population and putting them on your menu. If you catch a coyote remember that they taste a lot like dog and are consequently very tasty. Remember too that the carnivore meat must be cooked well. Try to wear rubber gloves when cleaning feral dogs. Naturally the materials you choose should be mated to the size of the critter you hope to capture. You wouldn’t choose 1/8 inch braided steel cable to catch rabbits though it is good for large animals. One of the least expensive yet flexible choices is simply known as “Electric fence wire”. This wire is easy to form, inexpensive and strong enough for animals up to about 60 pounds. If the critter has big teeth and a vicious nature, it may escape. You probably don’t want to tangle with anything like that anyway. Electric fence wire will work fine for animals down to rabbit size. This wire is available at many hardware and feed and grain stores. As another option, albeit a bit more expensive, consider any of the stainless steel deep-sea fishing “leader” lines. These lines, or wires, come as either a braided cable or as a single wire. The feature you are looking for is the ability to form the wire into a shape without it unraveling itself. Some wire fishing lines are made to be “tangle free”. This is not a feature you are searching for. As an aside, some monofilament (plastic or nylon) lines are acceptable IF you are trying to trap little critters like squirrels and rabbits. Among the wires I’ve found to be exceptional is stainless steel leader line in #60 test weight. If you purchase commercial stainless steel wire in bulk from a wire supply store specify 20-24 gauge malleable stainless steel wire. Most military “Trip wire” is to weak for anything but the smaller game like squirrels. For larger animals like deer, you might consider plain old “550 cord” or “Parachute cord”. When you select this cord there are a few things to look for. Real parachute cord is made in two parts. It has an outer sheath of nylon and an inner set of individual strands, usually about 7, which resemble string. The core is not just a mass of fibers. These discreet strings in the core give it a much higher abrasion resistance and as a consequence, the cord can withstand more activity from the game. You can also use the inner cords as individual snare lines or even as fishing line in an emergency. The final and strongest snare line is braided steel cable. 1/8 inch braided steel cable is capable of holding anything you can legitimately want to trap. It is frequently found on illegal bear snares and will hold animals of that size. It is also exceptional for deer sized animals. Some specialty sporting goods stores and catalog companies carry commercial snares. Snares like the Thompson snares have proven themselves in the field for many years. The current effort to stop trapping in the United States has resulted in some difficulty locating sources for commercial snares. If you do locate a source for commercial snares I strongly recommend that you stock up on them… in all sizes. Search the internet for sources of commercial snares like the "Thompson" snares. The business end of the snare is one of the most critical parts of the snare unit. Snare lines take a lot of abuse once the animal is captured. For this reason the termination of the snare line is very important. When I first started making snares I’d terminate my snare wire or cord with a simple single loop through which I’d pass the body of the snare wire. After losing a few meals to broken loops and slipped game I began to modify my loops to include a snare lock. The methods I settled on for corded snares, came down to an interesting knot called the “Prusick knot” for cord snares and a way of wrapping wire that would self tighten around wire snares. The Prusick knot is an old mountain climber’s trick for allowing a climber to ascend a relatively thin piece of cord, a cord that could not be gripped safely, if at all, by the climber’s hand. It is made from a simple loop tied in the end of your snare cord. The wire wrap is essentially just a couple of turns of wire that bend to grip the wire in snare wires. One of the easiest ways I’ve found to fashion this gripper requires nothing more than a small diameter twig. While this gripper works fine on solid wire snares, cable snares still suffer some slippage. If you can find a commercial snare you can take a look at the cable lock used and it becomes a simple matter of modifying a standard washer to perform the same function. A fun yet effective subsistence trap can be easily made from tin cans. The size of the can determines the size of the bird you can trap. As an example I like to use 1 pound coffee cans to trap quail. The setup is simple. Identify the area where you see the birds on your menu. Dig a hole just large enough to accept the can, open side up, so the top of the can is even with the ground level when the hole is filled. You will have a metal-sided pit. Sprinkle a bit of wild birdseed around the area with a slightly higher concentration in the area around the can. Put enough seed in the bottom of the can to cover about 50% of the metal. Leave the trap area. Your dinner fowl will peck their way to the can, see the food, jump in and discover that they are unable to jump or fly out of the container. Check these traps frequently, as they tend to fill quickly. Other predators, like cats will learn to stake them out. Tin can bird traps are especially useful for quail and grouse. If you want chickens, use a 3-pound coffee can and be prepared for bait loss to smaller birds like sparrows. The area around the can is good for cat hunting. There are several variations on this theme that can be useful in some areas. One of these is the so-called “Turkey Trench”. To make one of these you first identify a reasonable location. Then dig a trench about 12 inches wide by 18 inches deep at its deepest point and about six feet long. The trench should be dug as a ramp. Grain or corn is sprinkled around the area with a nice trail leading into the trench. The birds will follow the line of grain or corn into the trench. Most turkeys have a tough time going into reverse so once they enter they usually just stand in place until you harvest them. Trapping has been used as a way to get meat protein for tens of thousands of years. The techniques are clear-cut and effective. What you need to understand is that the meat you get is not what you are used to. The texture and taste will be different. If it is cooked in stews with familiar spices you and your family will hardly notice the fact that you are now shopping in your back yard. While there are many more traps and trap designs, the one’s I’ve suggested here will help you in your subsistence struggles. Practice with these traps! It is important that you learn how to use traps before you need to depend on them. If you really want to learn the ins and outs of traps… get Traps and Trapping Volume 5.